If you ever come across a program that goes by the name of TV Chrome, make sure to do everything that you can to avoid it. We highly advise you to do so because this application turns out to be yet another potentially unwanted program. Such classification has been made because this application exhibits invasive and otherwise suspicious features. It turns out that this dubious program could present you with large amounts of third-party web content, while you are browsing the Internet. In turn, such functionality will make surfing the web a much more annoying and frustrating experience, to put it lightly. In this article, we present further information about the inner workings of TV Chrome. You will also find a few virtual security recommendations and a comprehensive removal guide that you should use to delete TV Chrome without encountering any major problems. On its official website, TV Chrome is advertised as a great tool should allow you to watch various TV channels right within your browser; according to statements, it should provide access to thousands of channels, which should be sorted by your geographical location. At first, it might seem like a program worthy of having on your PC. Unfortunately, there is something suspicious regarding this potentially unwanted program. Once it gains full access to your operating system, it immediately installs a dubious browser extension, which can establish a lasting connection to an adware server. If that happens, you will start seeing an unusual amount of third-party web content within your web browser. In the majority of cases, such content manifests as various ads, pop-ups, and coupons. It goes without saying that such intrusive functionality, will make surfing the web a much more annoying and bothersome experience. In some cases, your web browser could get filled with so much of invasive content that your browser might crash without any warning whatsoever. It is important to note that all the ads, pop-ups, and coupons are completely useless. If you wish to regain your web browser’s default settings so you could surf the web the way you like once again, you must perform a complete removal of TV Chrome as soon as it is found active on your personal computer. To delete it quickly and easily, make sure to follow the detailed instructions that we provide below. If you fail to do so, the suspicious third-party web content will continue to bother you. 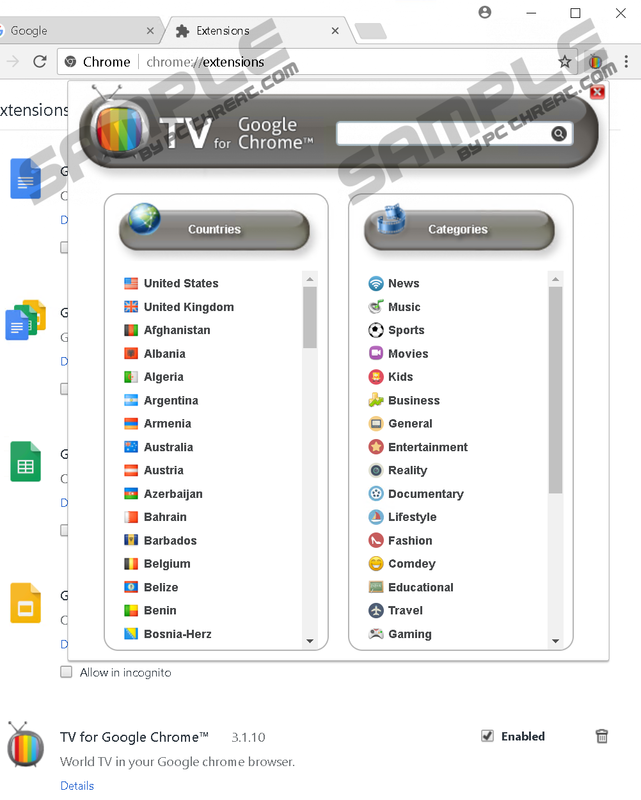 Even though you can download TV Chrome from its official website, it is important to note that it could be spread via bundled installers. This is a dangerous instance because malware developers often use such setup files to distribute their invasive applications. Therefore, if you already have TV Chrome running on your PC, and you did not install it consciously, make sure to conduct an in-depth analysis of your operating system for other questionable programs. If you wish to keep your PC free from any dubious program, you must take a few preventative steps. Firstly, we advise you to practice safe browsing habits. Avoid all questionable third-party download sites since they are infamous for hosting bundled installers. Furthermore, it is important to always learn as much as you can about the program that you wish to have on your computer before downloading it. That is imperative because malware developers tend to use hoax marketing techniques to lure unsuspecting Internet users into obtaining their suspicious programs. Finally, and most importantly, make sure to install a professional antimalware tool if you do not have one already. Such a tool is critical because it can detect and terminate any virtual security threat automatically. These simple preventative steps will make your operating system virtually unbreakable. Make sure to use the detailed instructions that we provide below, to delete TV Chrome once and for all. It is important to pay your utmost attention to the removal procedure because a single mistake could result in an incomplete removal. If that happens, you might have to face undesirable outcomes. For example, due to just a few leftovers, the potentially unwanted program could continue its invasive functionality. In other cases, traces might be just enough to trigger a silent restoration of TV Chrome. If you wish to be sure that the removal procedure has been successful, make sure to double-check your entire operating system for anything associated with TV Chrome once you are done with the instructions that we present below. Click the Chrome Menu button. Quick & tested solution for TV Chrome removal.